Curry leaf plant can be grown from seeds, stem cuttings or from suckers around an adult tree. Learn how to successfully propagate a curry leaf plant from stem cuttings, seeds and by layering following the easy instructions. The plant propagated from curry leaf seeds will be very slow, may be more than a year for the seedling to get established. The curry plant propagation by stem cutting and suckers are relatively quick to grow. A new curry leaf plant can be easily grown from curry leaf plant seeds. The seeds germinates at temperature around 21°C (70°F). 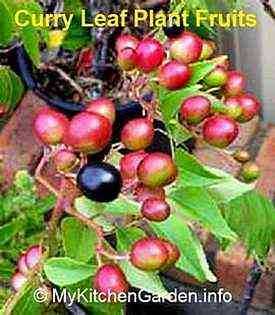 Pick curry leaf berries when they are almost ripe, becoming black in color. You can sow the whole ripe berry, but the germination will be slow and the success may be limited. It is better to squeeze the seed out of the fruit pulp and sow them in seed raising mix. Placing the curry leaf plant seeds in a moist paper towel for a few days before putting them in soil will speed up germination. Cover the seeds with soil and place in warm place. The seeds will germinate in about 10-15 days. Note that it may take longer to root if the temperature is low. It is pointed out that fresh seeds will germinate easily in a few days, whereas old seeds or dried seeds may not germinate or take very long time. To speed up the germination of curry plant seeds, soak the seeds in water for 1 day before sowing. Fill a small pot with the rooting mix, which is a mixtures of peat or pertile and sand, and water well before planting. Insert a pencil into the soil of the pot reaching up to 1 inch above the base. Take out the pencil. Taking Curry Plant Cuttings: Select a branch (stem) of the curry leaf tree which is neither flexible or nor stiff, means semi-hard. From this branch take a cutting of pencil thickness (about 5 mm diameter) and about 5 inch long with 4-5 leaf sets. Cut directly above the highest bud and a slant cut just below the lowest bud. Remove the lower set of leaves leaving top 2-3 sets. Cut each of the upper leaves into half or less. Put the lower part of the curry leaf stem cutting into the rooting hormone powder and shake off the extra powder. Push the cutting into the hole in the pot and firm it. Do not water it again. Put the pot in a polythene bag or (zip-lock bag) and tie the top end and place it in shade. In about 10 days, you will see your cutting to grow new buds. Keep the pot in shade for a few weeks until you find that the stick has become quite firm in the soil, indicating the root growth. Remove a sucker with its roots attached from a curry leaf plant from your friend. Plant this sucker in a pot or ground, water well and care as a new plant.